2018 NGL Grants: Miranda Martin; Glen Foulstone; Lilian Burgardt; Maria Tsedeviyn. Earlier this month, I spoke with Lilian Burgardt, Informa Brazil about being an NGL Grant recipient. 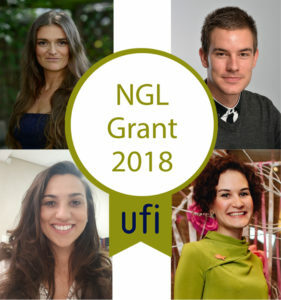 Now, let’s get to know UFI’s other NGL (Next Generation Leaders) Grant Winners. Miranda is Portfolio Director, Niche Events with Fresh Montgomery in the UK, Maria is the Head of Advertising, Design and Internet Marketing for ExpoForum-International, Ltd. in St. Petersburg, Russia, and Glen is Senior Project Manager for GES, also in the UK. Stephanie: What do you hope to do with the spotlight as an NGL Grant recipient and why? Miranda: I hope to bring a fresh perspective to the industry and feel strongly that b2b events should deliver stimulating business experiences; as emotionally engaging and ‘fun’ even, as consumer events. No more boring trade shows! We should deliver memorable experiences. This approach will attract more talent to our industry which is something I hope to be able to play my part in. Maria: Only one thing that I want to spotlight is the voice of young generation, especially here in Russia. Also, I want to show colleagues of my age that we need to learn and dream globally. Nothing is impossible if you are working hard and progressing your knowledge and skills! vastly increasing my industry network and knowledge. Stephanie: Miranda – What specifically have you done with the Independent Hotel Show to make it more memorable for attendees and exhibitors? Miranda: I’ve come to appreciate that simple but effective methods that break the traditional way of thinking are the most effective. My mind set is experience first and exhibition last, meaning that I think of the environment I want to create as a whole first, then about the components needed to make that achievable. For example, at the Independent Hotel Show, we curate the exhibitor/sponsor profile, so it’s in keeping with what you might see, feel, experience as a guest in a luxury hotel. A door man welcomes guests at the entrance to the show, like the way in which you’d be welcomed into a hotel. Simple use of what we call ‘hotel speak’ (our terminology), allows our community of hoteliers to easily relate to the subject matter. ‘The Guestbook’ is used to describe our visitor demographics; ‘The Suite’ is where we invite VIP hotelier guests to enjoy our hospitality; ‘The Lobby’, is a space that smoothly transitions from café and work station in the early hours of the show into a social hub complete with champagne bar in the afternoon and into the evening. We work with design partners to ensure that all communal spaces are designed to the highest specification in line with what our discerning hotelier audience would want – and expect in their own businesses. We work with multiple beverage partners to enable us to offer hotelier guests complimentary hospitality throughout the show. We provide a luxury gift as a thank you to our VIPs and speakers. We always strive to surprise and delight and be as hospitable as possible. In other words, we provide experiences that as a hotelier (our target audience), you’d be trying to create in your own hotel spaces. Stephanie: For Maria and Glen – What is your favorite thing about the exhibition industry/what you get to do? Glen: In addition to the satisfaction brought with the completion of any project, I have to say the travel opportunities are like no other industry. I’m sure we all hate airports at times but I would never have seen half the countries I have if it wasn’t for work, and I’ve got time to see plenty more, hopefully! Stephanie: For all three of you – what are your plans for the UFI Global Congress session? Miranda: This follows on the question above really… my perspective is about human2human business… remembering we are all people whose decision-making process is largely emotional. My interest is in profiling our visitor groups in new ways and match-making them with content relevant to their personality types as well as their business interests. Maria: We were chosen to present our generation, millennials, who have answers and our own point of view for the issues bothering the exhibition industry. We plan to raise the issue of cultural differences between acceptance and consumption of the new reality. Come to our session and experience it with us! Glen: I couldn’t be telling you that now could I!? 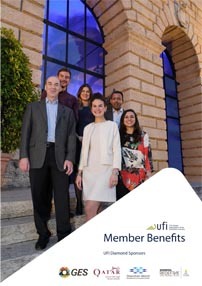 Attending the UFI Global Congress? Make sure to attend the NGL Grant Winners Session A Cultural Transformation for the Next Generation on Friday, November 2nd at 9:15am. You may also follow the conversation at #ufistpetersburg on Twitter and on UFI-TV. Interview with Miranda Martin, Maria Tsedeviyn & Glen Foulstone, NGL Grant 2018 Recipients by Stephanie Selesnick, President of International Trade Information, Inc.
Great questions and responses! The general belief that the power of our industry has a strong human element when measuring success. Nice to read these comments from some of the NGL grant recipients. Looking forward to your session.